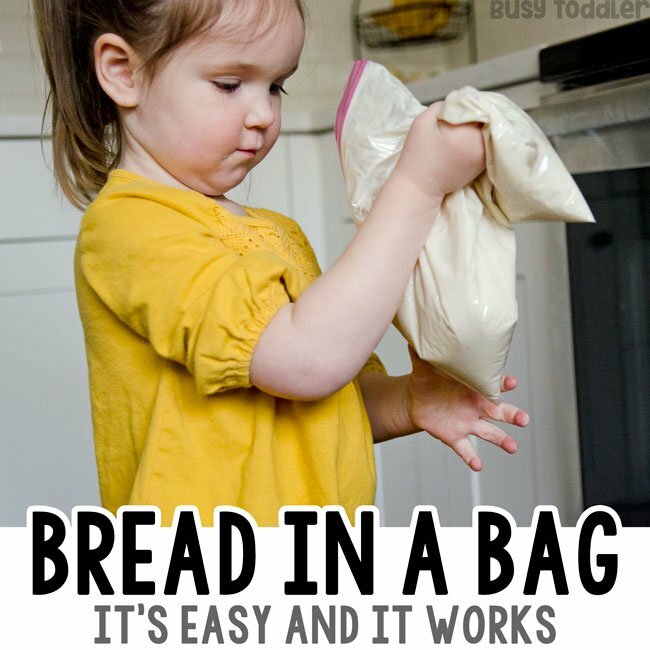 Did you know you can make bread in a bag? I know, this shocked me too and actually still shocks me today. I’ll answer the one question I know if in your head right now: does it work? YES! 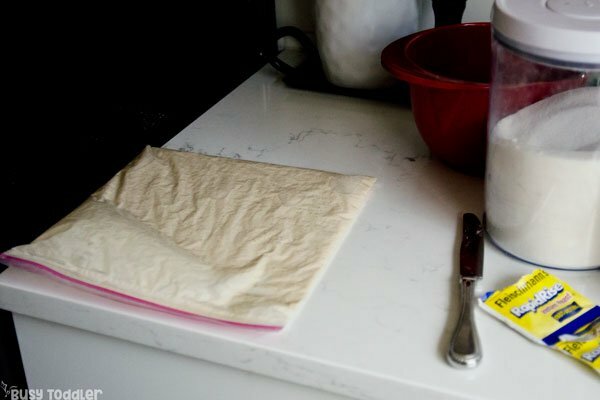 Making bread in a bag totally work – and I’m going to show you. 1. Making bread is no joke – there’s a reason Dave’s bread is so famous and also why bread machines were all the rage. 2. 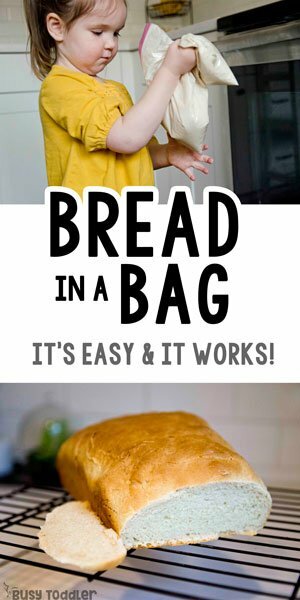 Can you actually make bread “in a bag”? This really had me stumped. But here’s what I discovered: this is one of the best kid activities around, because guess what? Bread in a bag is fun AND delicious. You actually make it in a bag. Yup, you make it in a Ziplock style bag – you only need one bag. 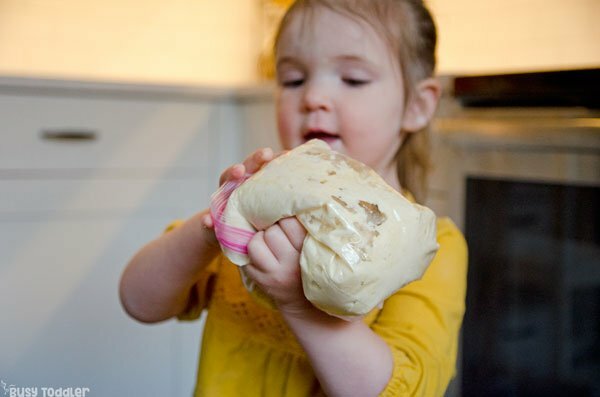 What I love about making bread in a bag is that it’s similar in feel to making ice cream in a bag or making butter in a jar – by that I mean, the kids really get into it and they get an appreciation for how the ingredients come together to make something amazing. Also something delicious comes at the end so all the fun / hard work is totally worth it. 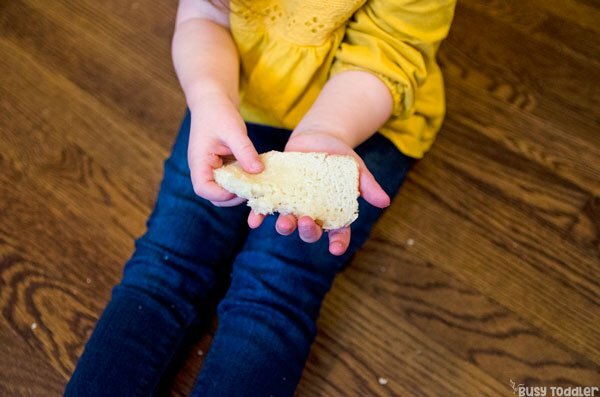 I adapted a recipe I found on Your Homebased Mom to make Bread in a Bag even more toddler/young child appropriate and fit my family’s tastes a little more (ie: more butter). The full recipe is at the bottom of this post but here’s the run down of it went. 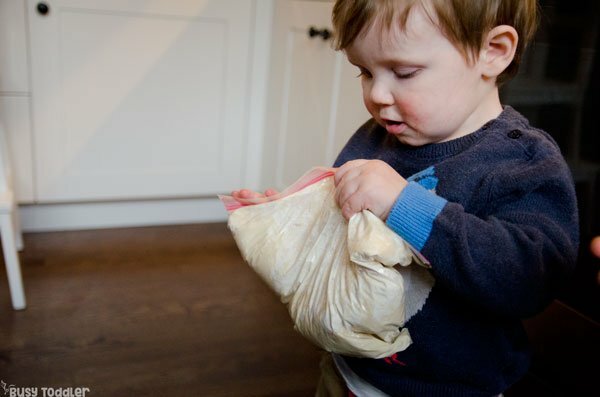 Grab a Ziplock bag and an excited toddler (or preschooler or neighbor kid or thirty something spouse who loves homemade bread – not trying to be uber specific here but I think you get it). You start by combining flour, sugar, and yeast. I had some trouble the first few times we made this getting my kids to pour the materials right into the bag. This didn’t work for their hand eye coordination levels so we went with a bigger target and just poured the first set of ingredients into the bowl and mixed them there. Then I poured the bowl into the bag, added the cup of water, and handed the sealed up bag back to my daughter (age 3) for shaking and mixing. I gave it a few good Mom shakes too and we set it to rest on the counter. 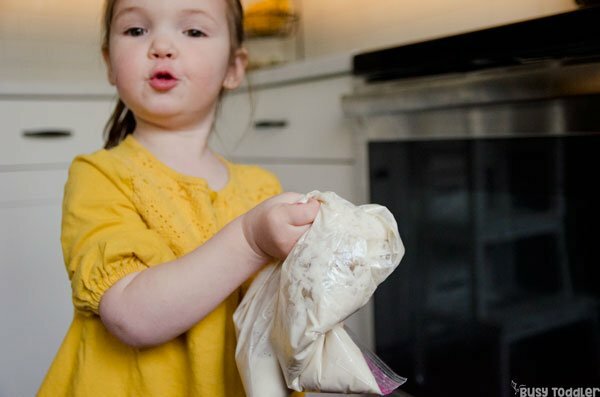 This is the “proofing” stage – letting the sugar, water, flour and yeast do a little party and make some bubble-filled memories. You wait about 10 minutes while the mixture proofs – we do a three song dance party and that’s usually about enough time. Next combine the flour and salt in a bowl, and pour it into the bag along with the melted butter. 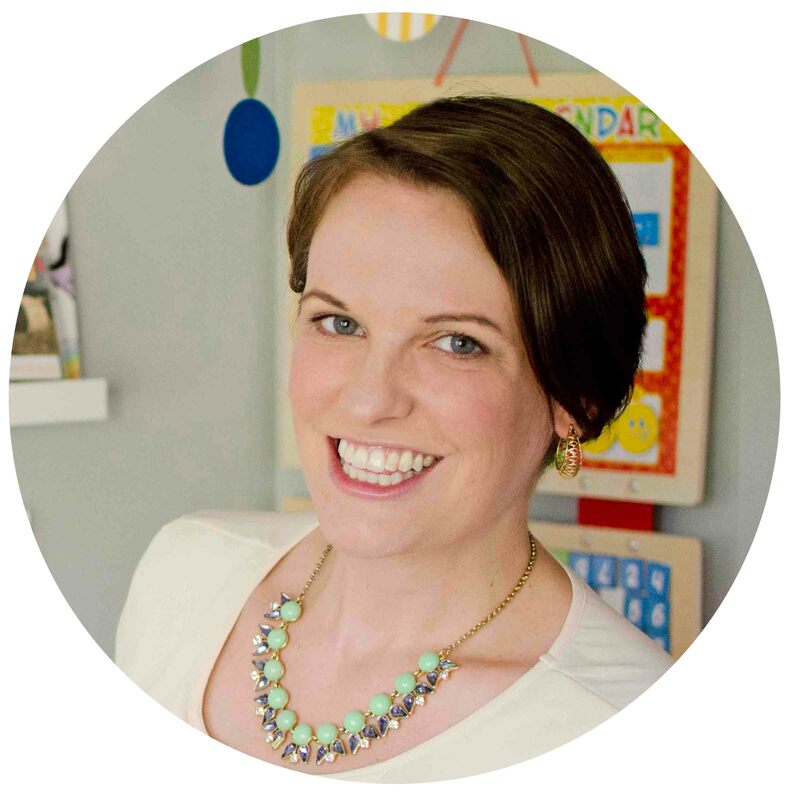 Have your toddler begin the shaking, mixing, and smooshing again. You’ll start to see the dough pulling away from the bag – that’s a good thing! The butter is doing its job. Last step for the bag is to add the final cup of flour. Mix, shake, and dance again. It’s time to knead the dough. 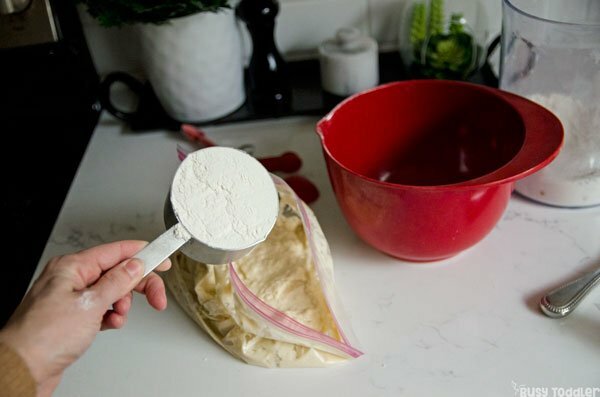 Pull the dough out of the bag and onto a floured surface. 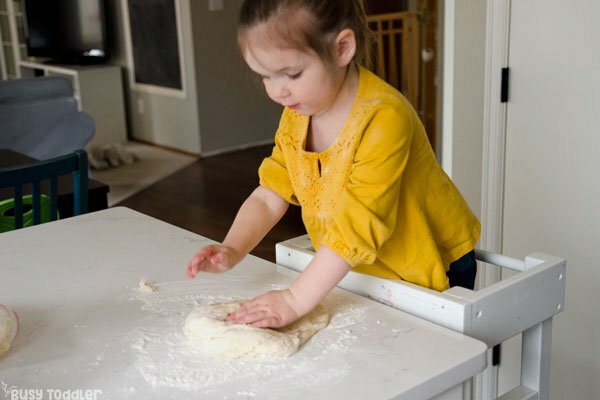 Model for your toddler how to knead dough. You’ll want to knead the dough for 5-10 minutes. 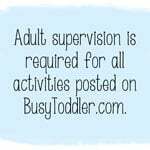 I help my kids do this and we make it all sorts of fun. Then we count to 20. Sometimes we count to 100. Next we do the alphabet song, some nursery rhymes, and sing a few other songs. 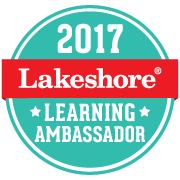 Before you know it – you’ve kneaded long enough! Get your loaf pan ready! Grease your loaf pan and place the dough into it. Cover with a towel and leave it in a warm spot in your house for 30-45 minutes to rise. 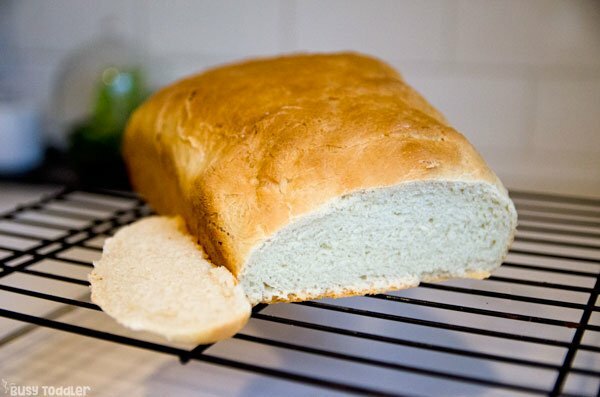 There’s nothing in the world like homemade bread. Is it going to win any awards? No. It is going to get me onto Top Chef? Probably not. BUT what it is delicious, a memorable experience, and something to help you make it to nap time. But seriously, you should do this. This is one of our favorite activities. 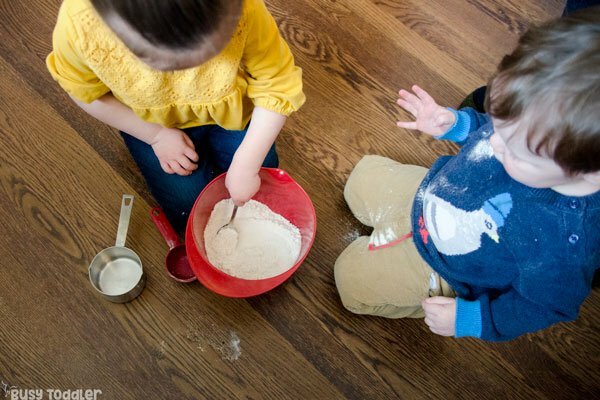 Group of toddlers running around your house making mischief: make bread. When will you make bread-in-a-bag? Combine 1 cup flour, sugar, and yeast packet in a bowl. Pour into a resealable (Ziplock style) bag. Add warm water. Seal bag, pressing out air. In a bowl, combine 1 cup of flour with salt. Pour into bag along with melted butter. Seal bag again, pressing out air. Shake and mix again. Open bag and add in last cup of flour. Seal bag, and mix for final time. Pull out dough and place on a floured surface. 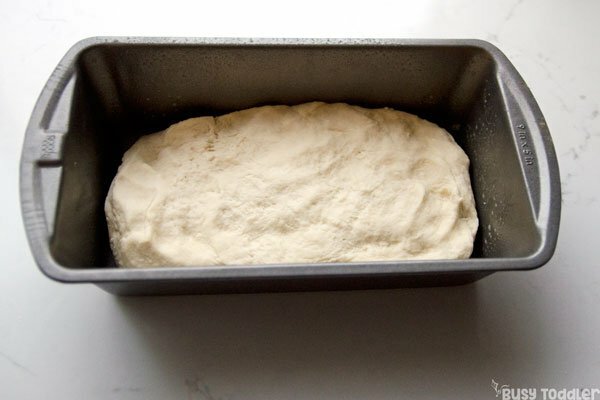 Place dough in a greased loaf pan. Excited to try this with my little man! Do you have to do anything different if you use traditional yeast instead of rapid rise? Thanks for so many great ideas! I made this with my 2 year old last week and we both loved it. Not only is it fun for them, the mess was minimal, and there was a surprisingly tasty snack at the end! We will definitely be making this again. Thank you!